The Hydro Power Box Hybrid light tower is the hybrid configuration of the Hydro Power Box model. Thanks to its high safety features, the Hydro Power Box Hybrid is a light tower ideal for illuminating live events like concerts and sport matches, even placed near the public. The HPB Hybrid provides up to 8 hours of continuous operation without carbon dioxide emissions, fuel consumption nor noise, thanks to the battery pack. The special dry batteries are able to be recharged in less than 5 hours and have a 100% guaranteed charge/discharge cycle of more than 4000 hours. The batteries cab be recharged from either an external power source or from the built-in backup generator. 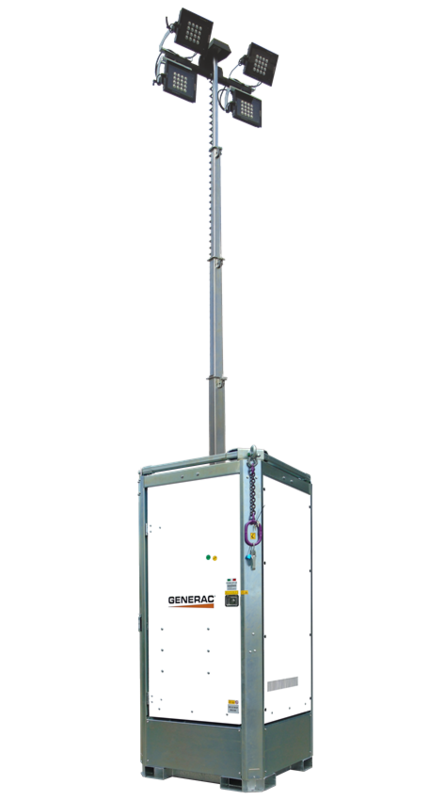 When the Hydro Power Box Hybrid has utilized all of the stored energy from the battery pack, the diesel backup generator will automatically start, providing all the energy required to power the lamps and at the same time recharging the battery pack. When the battery pack is fully recharged, the generator will automatically turn off. When the Hydro Power Box Hybrid is powered through the battery pack, it is completely silent and doesn’t emit carbon dioxide (CO2). An ideal solution for events and working areas with low noise or CO2 emission requirements. Thanks to the hybrid features and the LED lamps, the Hydro Power Box Hybrid can run more than 1200 hours without refueling. The Hydro Power Box Hybrid has two large doors to easily reach the technical area. The lamps can be easily adjusted by using the ladder included in the machine.